Item is a photograph of a group of city officials on the steps of City Hall. 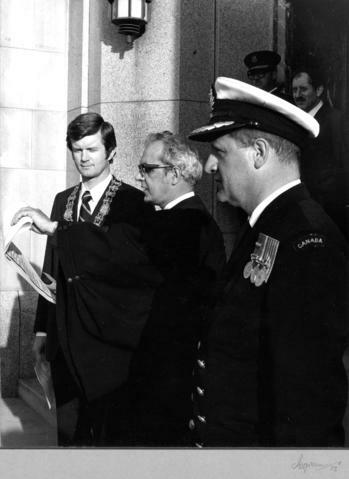 Identified individuals are: Vancouver Mayor Art Philips (front left), City Clerk Doug Little (front centre), and Alderman Harry Rankin (back right). Donated by the Office of the City Clerk, City Hall, Vancouver B.C., in 1974. Pink stamp on verso of mat: "Alan J. Ingram / Photograph / 987-9620". Copyright: Alan J. Ingram; expiry: 2060-01-01.